Day Pass: Day Pass allows for same day in and out privilege and is available for purchase at the parking pay stations for $6.00. From the parking pay machine press Day Pass, this will change the screen to say pre-pay up to 23:59. Monthly parking passes: Available for chronic care patients and their visitors for $50 per 30 day period and can be purchased at the Cashier (behind the Gift Shop). Validate your ticket inside at one of the Pay Stations (located at the Main East Entrance; Outpatient Laboratory; Main West Entrance or Town Square Entrance) before you leave. 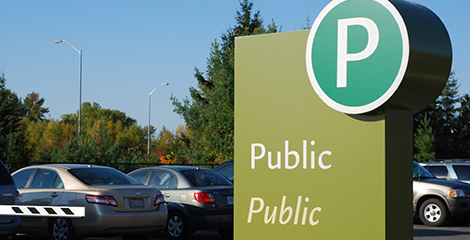 Public Parking Lots: Lots 2, 5 & 9 are designated public parking lots. Lot 7 is located outside of SportsMED+ Outpatient Rehabilitation and is ONLY for patients using those services only. Paying for parking as easy as 1 2 3 4! Approach the parking gate and take a ticket. The gate will open and you will be able to enter the parking lot. Before you can exit the parking lot, you will need to take your parking ticket to one of the pay stations. Three are located in the central Lobby, east end; and one in the central Entrance by the Cafeteria. At the pay station, insert your parking ticket and pay the amount shown on the screen. Take your paid parking ticket back to your car, drive to the exit gate, and insert the paid ticket in order to lift the gates. Alternatively you can insert your credit card at the exit gate and the amount owing will automatically be charged. The system allows for a 20 minute grace period from the time you pay for parking at one of the Pay Stations in the building to the time you exit the parking lot gates. The system also allows for a 15 minute grace period for those who may simply be here to pick up or drop someone off. Tokens will not be in use at the NBRHC in North Bay; however they will be used at NBRHC Kirkwood Place in Sudbury. Are there same day in and out privileges? Yes, for this option please select ‘Day Pass’ located on the Pay Stations. This pass allows for multiple visits on any given day. For more frequent visits associated with treatment for a chronic condition or if you are routinely visiting a chronic care patient, we recommend the purchase of a Chronic Care pass. How do I access a Chronic Care pass? Passes can be purchased from the Cashier located by Switchboard. The pay stations will accept coins, bills and credit cards. Bank machines are located in the Central Lobby between the pay stations and in the Cafeteria if the use of a debit card is required. What if I forgot to pay at the pay station? For those who have forgotten to pay, the exit machine will accept credit cards. There are a number of accessible parking spots located within close proximity to the entrance to both the main entrance and Emergency Department.